Most of these bars and nightclubs, plus a few gay-popular restaurants and cafés, are within a compact area near the beach in Waikiki, all within an easy walk of many resorts and hotels. But you'll also find some restaurants around Honolulu, notably in Chinatown, that have a bit of a mixed gay/straight bar scene as well as some downtown Honolulu dance clubs that have occasional gay nights. In the heart of Honolulu's hip and increasingly trendy Chinatown neighborhood, Bar 35 is a great all-around place to sip drinks inside at the long bar or out on the patio, and to nibble on exceptionally tasty pizza. Try the pie topped with Chinese sausage, sweet chili sauce, cilantro, tomato sauce, and mozzarella. The fries, available with 14 different dipping sauces, are pretty addictive as well. Bar 35's other big draw is the seriously vast beer list—more than 175 types, including Kona and Mehana varieties from Hawaii and plenty of other craft beers from Oregon, California, Colorado, as well as Belgium, Canada, China, and the U.K. Beer aficionados shouldn't miss this place. The crowd is friendly and urbane, mostly straight, but always pulling in a fair number of gay folks, especially as Chinatown's bar scene continues to appeal to an increasingly eclectic crowd. Waikiki saw the opening of its first gay bar in many years when this cool little second-floor bar opened just off Kuhio Avenue in 2011. Bacchus Waikiki serves a nice mix of basic and top-shelf drinks, including a wide range of wines and several good beers. There's a compact main room, a smaller side seating area that's a perfect spot to hold court with a few friends, and a narrow outside balcony and railing overlooking the street below. Another gay nightspot, In Between, is within a couple of blocks, and there's a nice Thai restaurant called Siam Square that's adjacent to Bacchus. The crowd at this bar, opened partly by San Francisco's popular 440 Castro, is fairly mixed, drawing locals and tourists, a fair number of women as well as men, and an all-ages bunch. It's an especially nice place to have drinks early in the evening, perhaps before heading to dinner at one of the many dozens of restaurants nearby. Another cool, artsy, inviting little hangout in funky Chinatown, Downbeat Diner & Lounge is a great spot for drinks or dinner. Like nearby Bar 35, it's a mostly hetero hangout, but it does have a relatively mixed following and is as fun for socializing and cocktails at the small bar in the back as for eating—just grab a seat in one of the comfy booths. Downbeat serves some breakfast items as well as more typical, but inventively prepared, lunch and dinner fare throughout the day: burgers, buffalo chicken sandwiches, volcano fries with garlic and Cajun seasoning, plus loco moco, French toast, waffles, and more from the breakfast menu. Note also the extensive selection of luscious milkshakes. Adult beverages include a solid selection of wine and beer plus some fun cocktails, including a lavender Tom Collins that's a hit with the brunch crowd. No gay bar in Honolulu is more celebrated and, arguably, beloved than Hula's Bar & Lei Stand, which occupies a second-story semi-open-air perch inside the Waikiki Grand Hotel, in a space it's been in for many years following a move from Kuhio Avenue, where Hula's thrived for more than two decades prior. The handsome club with a good-size dance area, a center bar, and lots of table and bench seating on the balcony starts to get busy in the afternoons, when sun bunnies from nearby Queen's Surf gay beach drop by to mingle and refresh, and to take in the big views of Diamond Head in the distance. While historic as gay bars go, Hula's has continued to reinvent itself over the years, adding fun theme nights, booking excellent live bands, and working hard to keep its very loyal and mixed crowd of gay men and lesbians of all ages happy. Most recently, the bar unveiled an excellent new food service. The kitchen turns out delicious small-plate-oriented American fare with contemporary, global twists: quesadillas stuffed with five-spice duck and topped with a raspberry chipotle sauce, for example. On weekends, brunch is served, including everything from French toast to eggs Benedict. On Saturday afternoons, Hula's organizes gay catamaran cruises; these are a very fun way to make new friends and enjoy a quite different view and perspective of the Waikiki skyline. 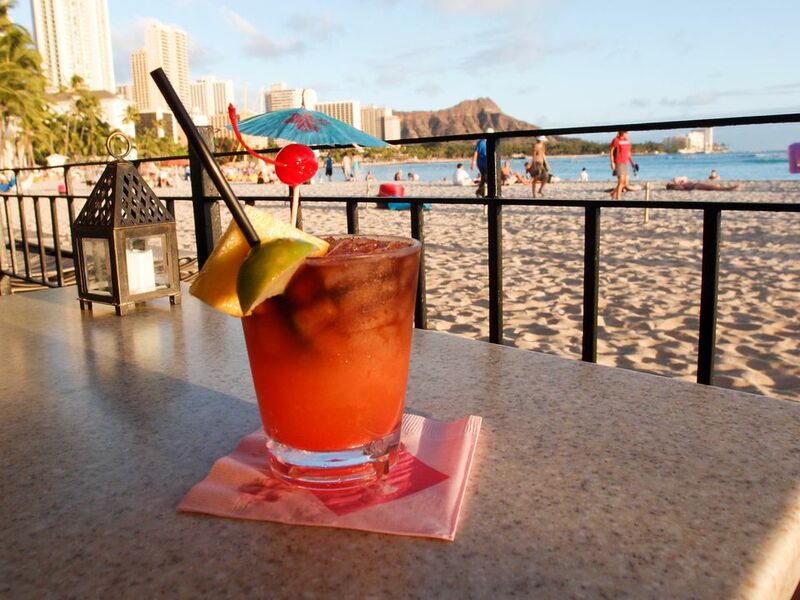 Hula's is also a short walk from a number of gay-friendly hotels. It takes a little effort to find cozy In Between Waikiki, which is a friendly little neighborhood gay lounge right beneath Velvet Video adult boutique. It's tucked down a short lane just off of Lewer Street; once you turn the corner, just walk maybe 100 feet, and you'll see the entrance to the bar on your left. It's opposite the side entrance to the Aston Waikiki Joy Hotel (a great, gay-friendly lodging choice). In Between Waikiki draws a predominantly male crowd and is a relaxed place with a conversation-friendly noise level and personable bartenders. It's a good spot to hit before continuing a couple of blocks north along Lewer to Bacchus Waikiki. Consistently one of the best restaurants in Hawaii for locally sourced, farm-to-table contemporary cuisine, Town is a short drive north of Waikiki in the eclectic and increasingly food-driven Kaimuki neighborhood. The domain of talented chef Ed Kenney, Town is a sophisticated but relaxed space, which is nice whether you're in shorts and T-shirts or out celebrating a special occasion. The food is a departure from most of what you'll find at even very upscale resort restaurants, with a focus on regional American, Mediterranean, and some Asian ingredients. Typical treats include polenta, pancetta, bitter greens, and a sunny egg at breakfast; hand-cut pasta with Big Island beef ragu or baby arugula with beets, fennel, and orange at lunch; tombo (a type of Hawaiian tuna) with green lentils, summer squash, escarole, and roasted tomato at dinner. Save room for the "milk and honey" buttermilk pannacotta. And note that Town is BYO-friendly but also has a terrific wine list and serves creative craft cocktails, making it a good bet if you're simply looking for a cool bar where you can nibble on appetizers while you drink. Grab one of the few patio seats if you can. A favorite gay-friendly restaurant for everything from breakfast to dinner, The Lanai at Mamala Bay occupies a large space near the airport, making it a good pre- or post-flight stop. The Lanai at Mamala Bay serves up tasty food including truffle mac and cheese, Tahitian ceviche, macadamia-crusted chicken, Cajun jambalaya, and numerous types of hamburgers.